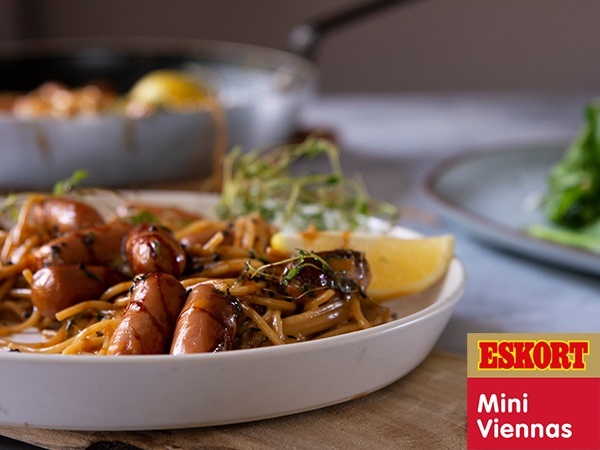 A creamy, cheesy pasta mixed with mini viennas and Marmite is the perfect #JustDelicious meal for busy kids who need to refuel after fun weekend activities! cook the spaghetti until al dente. Remove from the heat, ladle out a cup of the pasta water and keep aside. Drain the pasta, drizzle with olive oil and set aside. Add some olive oil to a large saucepan over moderate heat. Add the thyme and viennas and fry until golden. Add the cream, Marmite and starchy water and stir to combine. Add the spaghetti, butter and cheese to the saucepan and swirl until all the spaghetti is coated with the sauce. Serve with baby spinach or rocket.